In 1939 Poland started to rearm MG-armed TKS tankettes with a domestic model of the 20 mm FK-A gun. No more than two dozen of these vehicles entered service by the outbreak of World War II. Having the advantage of a small silhouette and good agility, they appeared quite successful tank destroyers, for 1939 standards. You can read more on my page http://derela.pl/tks20.htm. 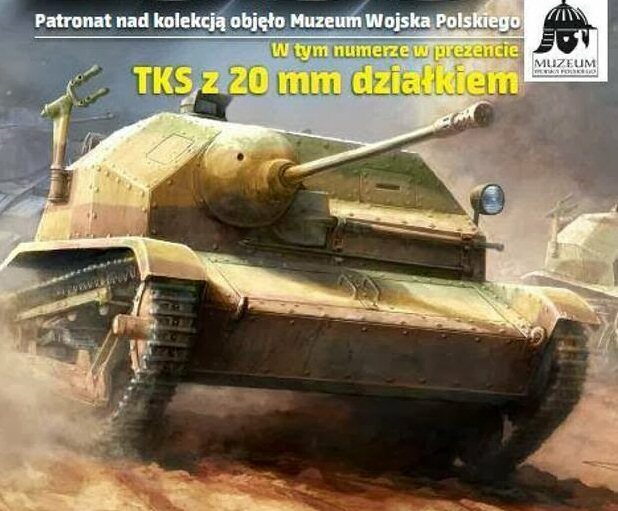 The FtF TKS kit with 20mm gun appeared as a pilot issue of the First to Fight periodical series (aka Wrzesien 1939) in 2013. The kit has been designed as a quick build, with major subassemblies being cast in one piece. There is only one sprue with 12 parts. I won't go here into details, which are described in Marc Mercier's review. It should be noted, that this kit is also used as a basis for later FtF no. 015 kit: TKS with 7.92mm MG, which has an additional sprue with two parts (the MG and its mounting). Therefore, these remarks largely concern also no. 015 kit. Direct competitors of this kit were the older injection models by RPM and Eso (http://www.onthewaymodels.com/reviews/ESO/TKSprev.htm - the later is out of production), which both offer an option with the 20mm gun. Also, for a Western market, its competitor is an older resin model by Alby (a review of MG-armed version, differing only in armament: http://www.onthewaymodels.com/reviews/ALBY/TKSrev.htm). Being interested in Polish tankettes for many years, I must say, that I am really impressed with the look of the FtF model. In my opinion, this is the best popular 1/72 model of a TKS tankette so far, way better externally than the aforementioned kits (it is inferior only to the photo etched model by Part, for expert modelers). First of all, it has more subtle and sharper details, especially the flat observation hatches with engraving around, which were ignored by other manufacturers. All in all, it has much a better (and closer to the original) general look. Details, especially on the roof, match published plans of TKS tankette very well, on contrary to the aforementioned kits, which have bigger or smaller inaccuracies in details or even shape (especially visible in the upper hatches and superstructure front of the Eso kit). Overall dimensions are correct as well. A peculiarity of a quick-build kit is, that a suspension is cast as one piece with tracks (like in a resin model by Alby). Despite it, the details are crisp, tracks are thin and the whole effect is very good, when viewed from a perspective. A drawback is, that it needs very careful painting. The complete suspension unit is only 36 mm long and the tracks are less than 2mm wide. Considering the fact that the whole suspension consists of small parts, without big gaps between them, this might in fact be the best way to retain a natural look of the suspension. (The RPM model has the suspension in one part and the tracks as another, what makes painting easier, but the details are not that good and the tracks are too thick. The Eso kit suspension is made of separate parts, which need some advanced skills, but gives a controversial effect). The FtF suspension parts have a more correct shape than the one in the Alby kit. If anyone wishes, Part produces a photo etched suspension for the RPM kit, which should be useful also in this case. FtF tankettes can only be made with closed hatches, while the RPM ones have open hatches and an interior and the Eso kit has open hatches (too small, though). There are no rivet imitations on the vertical plates, but this due to the is technological limitations, while the rivets on other places are subtle and not oversized. - the muffler lacks an exhaust, which is a strange omission, but relatively easy to fix, even using some cardboard. - the rear spare wheel holder has a slightly wrong shape - it should be slanted towards the bottom, what can be improved by some cutting. firstly, easiest to apply: canon armed tankettes did not have an anti-aircraft MG mount (since they had no MG) - this is an error in the instructions and it simply should be omitted. finally, the most disappointing error: the 20mm barrel should not be mounted centrally in its hemispherical mantlet, but a bit to offset left. The thin barrel is quite brittle too - it broke twice in my service, but I managed to glue it back (btw: one photo has a cut-off barrel, because I noticed, that it's broken only after I took it). It should be noted, that most of these faults are also present in earlier mentioned kits of cannon TKS tankettes, which also share the same body with the basic variant.